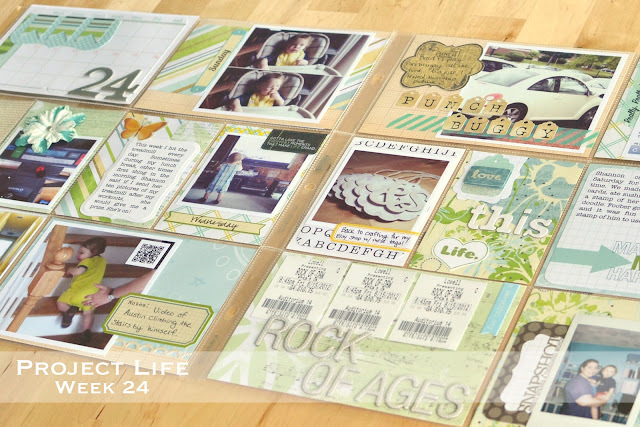 Welcome to Project Life 2012, week twenty four. I finally, finally nailed it. :) This layout is what I've been striving for. It's my favorite one since I started Project Life. Of course, this means I'll have to live up to these standards each week, so I'm totally screwed, time-wise. Here's my full layout this week. I got a lot of inspiration this week from Michelle Wooderson. 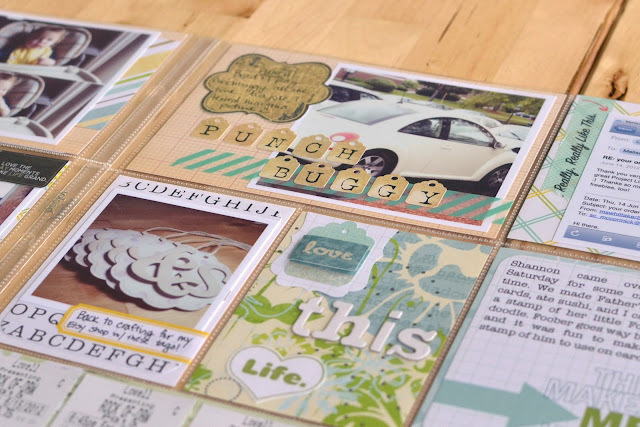 Her layouts are always incredibly gorgeous and full of embellishments. This week I only had iPhone pictures (and one Instax), so I thought I'd take a different path than usual and make each pocket it's own little mini layout. I've also decided I no longer want to round the corners of my photos/inserts. 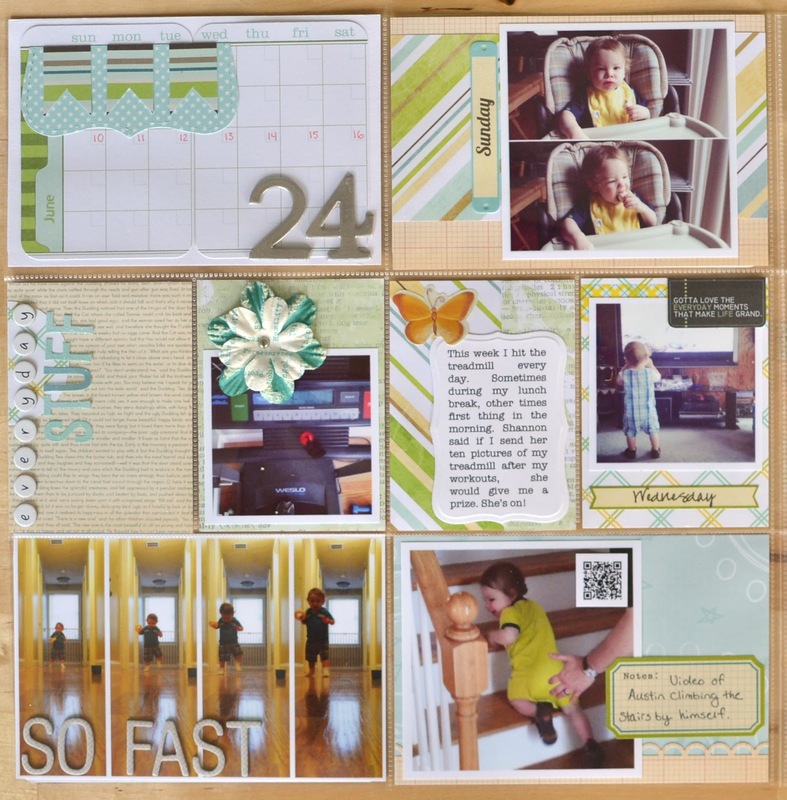 I love, love, love the square look with the white borders. Here's a closeup of the first page. On this page, I started with my title card, which determined my color scheme for the entire layout. I used a couple of cards from the Turquoise edition that Lindsay passed along to me, and I marked the current week with a Sharpie pen. I die cut the label shape at the top with my Top Note die (my absolute favorite die ever), and then added some flags to it. 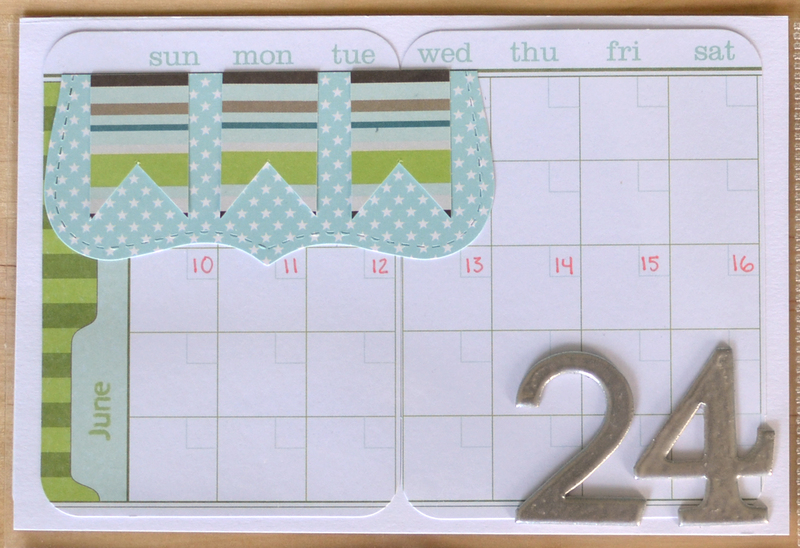 Then I die cut the 24 for the week and embossed those with silver embossing powder. You can see in this picture part of the paper flowers I included in one pocket. I just used a silver brad to attach it to the paper. You can't see it from this angle, but the flower says "perseverance." I liked that to use with one of my workout pictures. I've been running every day this week. 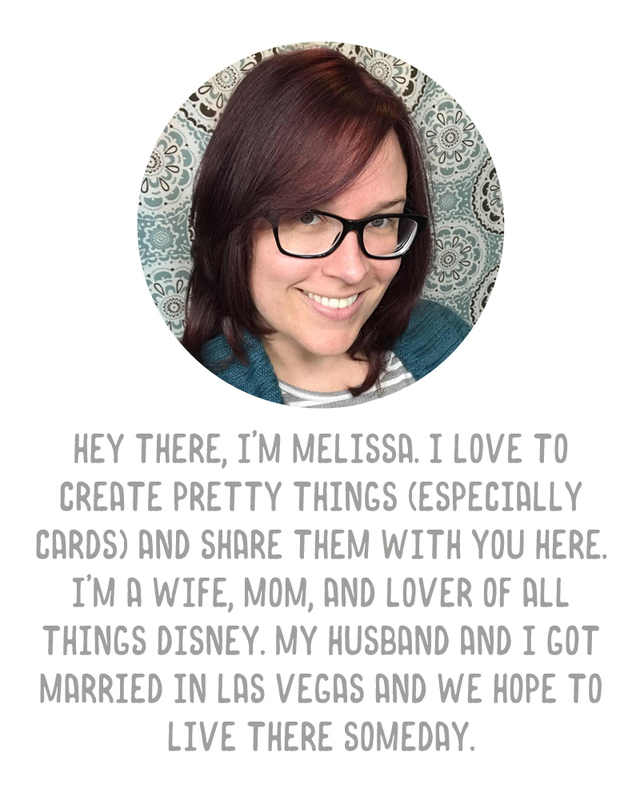 I created a text box in PSE that fit my Labels 8 Nestie I wanted to use as a tag in one of the pockets and printed it out on card stock. Then I die cut the tag around it. Added a little butterfly sticker I had from an old sticker set. 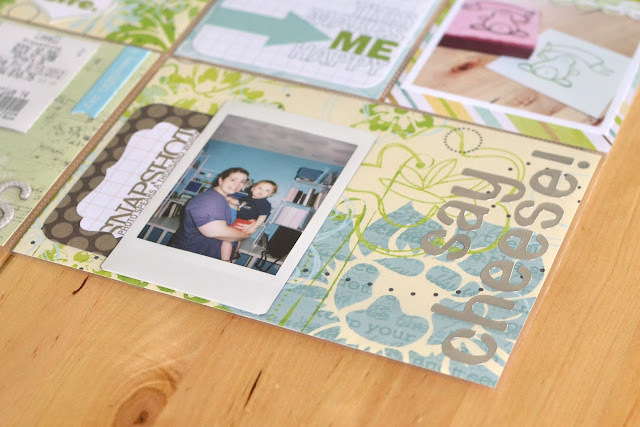 The card to the right of it used a section I cut out from one of the Turquoise cards, over the Instagram photo of Austin. I used a Jillibean Soup label for the day. I got a little inspiration from Catherine over at Design Editor for the collage of Austin running down the hallway. Topped it off with some thickers from Amy Tangerine. 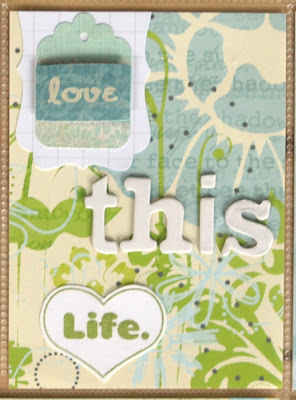 On this page, I printed directly on one of the Turquoise journaling cards (this was pretty easy to do, and there are tons of tutorials online and on Pinterest for doing so). I included a photo of a rubber stamp I carved of Shannon's little Foober. And I also made a pocket just for our ticket stubs from Rock of Ages. 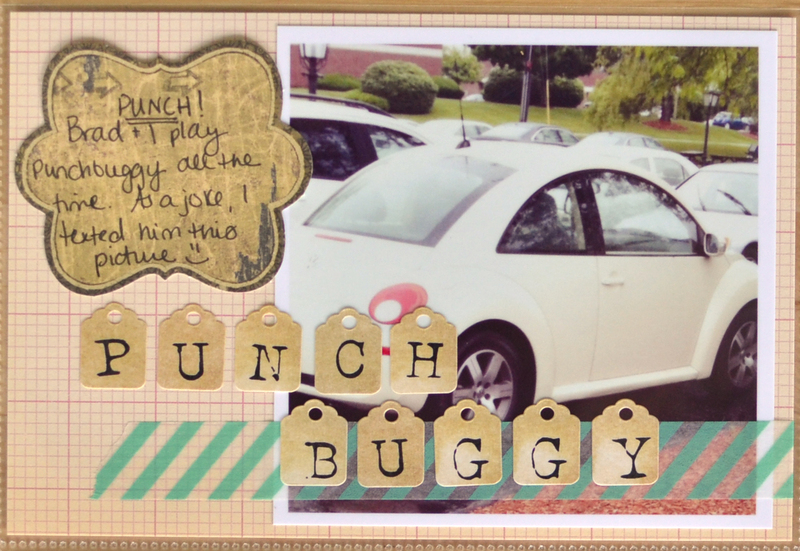 My favorite pocket of the whole spread is the punch buggy one :) Brad and I play the punch buggy game all the time, and I texted him a photo of one that was in my work parking lot one day. Also on this page was a decorative insert I made using a sticker, thickers, and a Studio G stamp that I cut out. 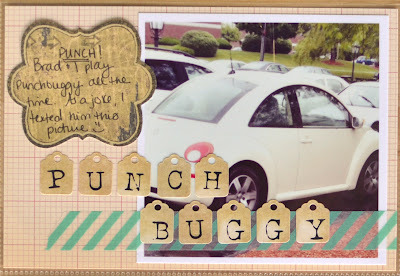 I added some Smash tape and a Martha Stewart tag that I stamped with a Stampin' Up! smile stamp. I just used some silver letter stickers to tie it into the silver embossing on my title card. The label beside the photo is a cutout from one of the Turquoise cards. I can see why you love this one so much!! I love all the little things, and that they don't look busy or cluttered. 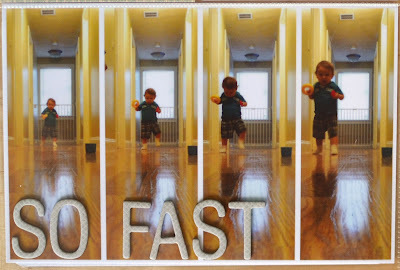 The "So Fast" pic collage is by far my favorite, what a cool idea and look at him go!! Thank you! :) I feel that way too - there's lots of little things but I feel like they're still kind of clean looking, if that makes sense. You really did a great job!! Love the colors and the way you grouped the embellishments on each card in the pockets. Thank you! I had so much fun with this one. 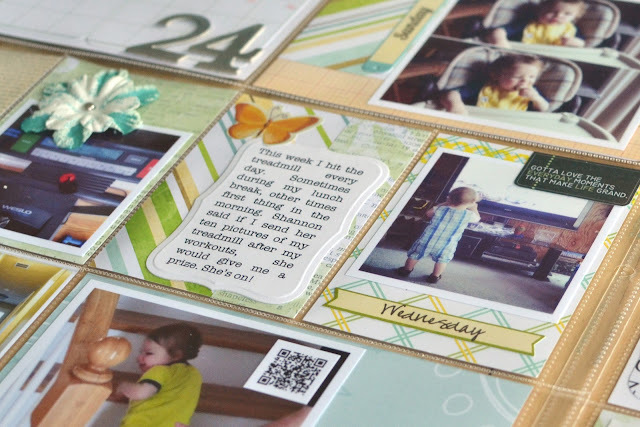 Absolutely love these layouts--and it's so funny because as soon as I saw them I thought of Michelle Wooderson!!! I, too, love the way each of her pockets is brilliant. I can't always do that though, my kiddos see to that! Thank you! Michelle's layouts are amazing. I can never live up to her standards - she's just such a great designer and so creative, but she's fantastic inspiration. PS - my sister's name is Heather Johnson. Too funny! Really like the blues and greens this week and love the shaped journaling spot you die cut. 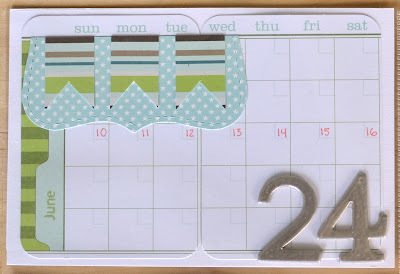 I used one of your days of the week freebie journaling cards this week, thanks again for sharing your talents with us! Oooh! Yay! So glad you used it! I like keeping to a color scheme, I think, so I'm going to try that again next week - like, choose one paper to start the layout and build around it. That seemed to work well this week. Oh, love the tone of this week. 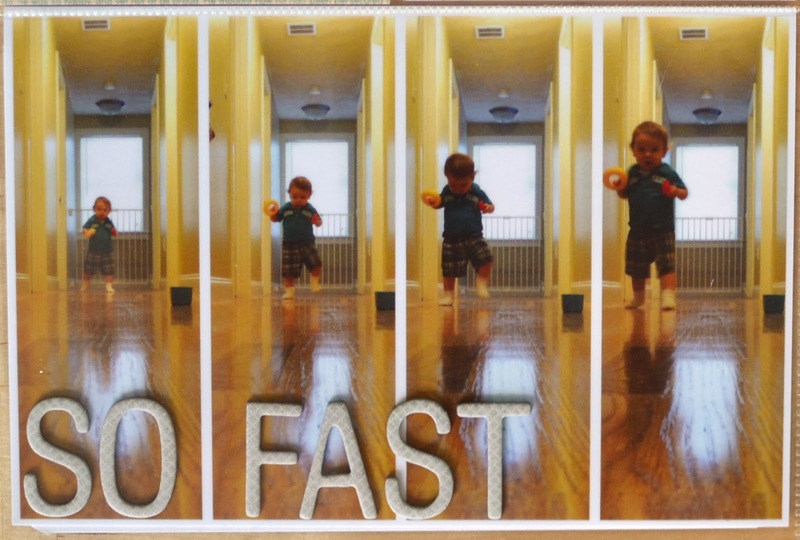 The "so fast" card is super adorable too. Thank you! Totally inspired by your pictures! 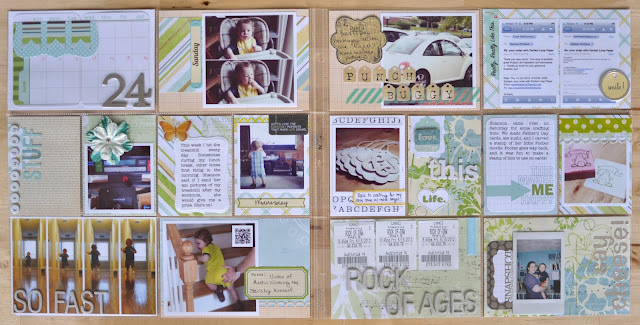 Love your pages this week. The collage "so fast" is fabulous. What a great idea! This is awesome! I love your color scheme and all of your alphas. The detail is amazing! 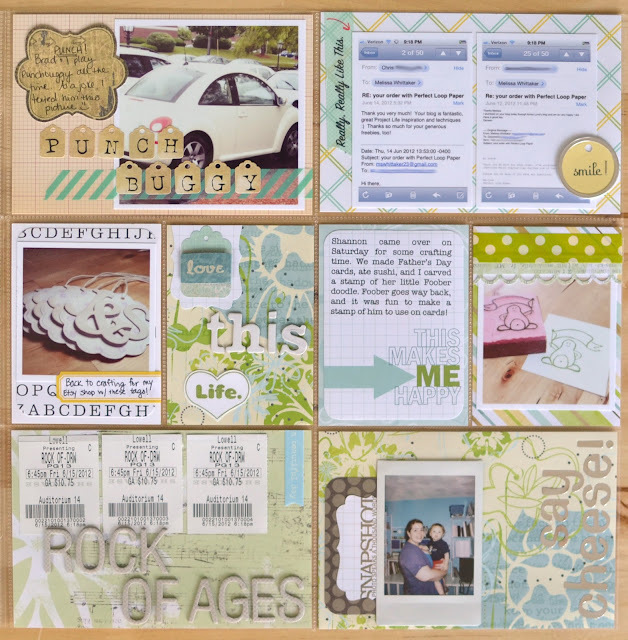 I love the color scheme and the whole flow of the layout - very nice! 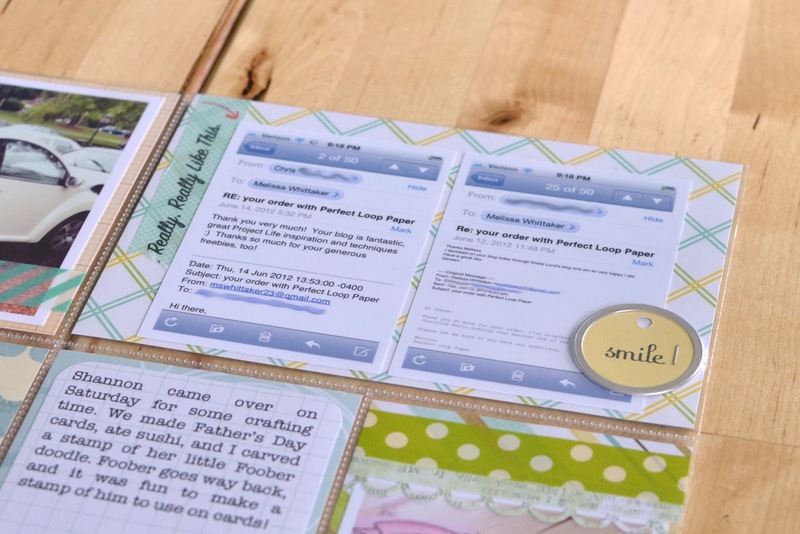 I just found your blog, from your link on the Project Life Tuesday post on The Mom Creative blog. I just wanted to tell you that I love this layout and how you did each pocket as it's own mini layout. I must try that! !